Get your adrenaline pumping on a Flyboard or a Jet Pack! Soar through the air and dive into the water after receiving training. This 30-minute Flyboard and Jet Pack rental session is unlike anything else. 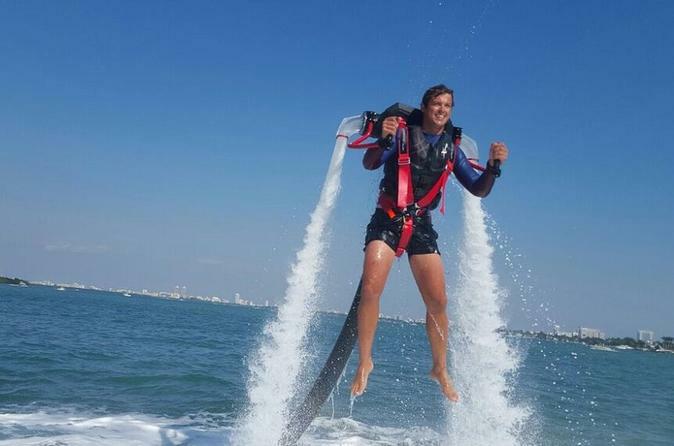 Choose between a Flyboard and a Jet Pack, pick either a 30-minute or 1-hour session, and select the best day and time to try this exciting activity. Then, arrive at Jet Boat Miami, located at 1635 North Bayshore Drive. Receive extensive training on land and in the water to ensure your safety and comfort while flying either a Flyboard or a Jet Pack. After you feel comfortable and are ready to fly on your own, enjoy soaring above the Biscayne Bay. Get your heart pumping and your adrenaline rushing as you try one of these incredible water toys. Take adventure to the next level on a Flyboard and a Jet Pack with this exciting rental.